These paintings were made following the acquisition of an unfamiliar type of fluid acrylic paint. Used in conjunction with transparent acrylic medium, this milky, opaquely-pigmented paint was well-suited to the production of washy, drippy layers, and allowed for the creation of bleed patterns unique to waterborne pigment, as well as fine, meandering, linear brushwork. The colors and patterns were derived, in equal parts, from science fiction/fantasy illustration and custom automotive paint jobs, a debt directly underscored by the addition of airbrushed stars-- a trope common to both cultural antecedents. These paintings were produced contemporaneously with the moiré pattern paintings and the trochoids. 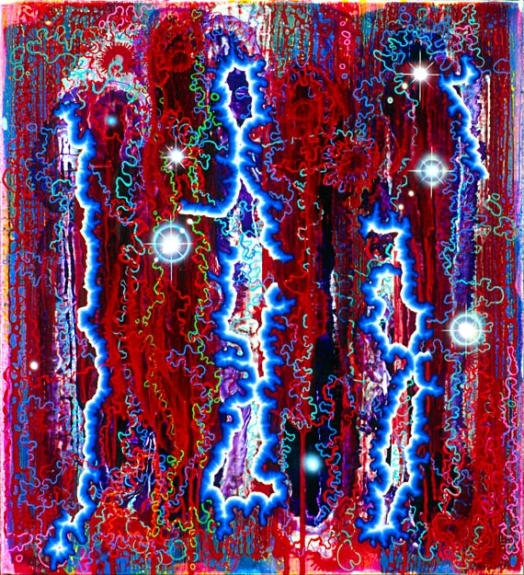 That these three divergent bodies of work were exhibited side-by-side in 1999 at Greg Kucera Gallery, Inc., prompted some viewers to question whether such dissimilar approaches to pattern and abstraction could be regarded as any kind of coherent formal statement. A more apt conclusion might have been to see in the combination of these works a commentary on the problem of the signature image in abstract painting. It is the artist’s desire for each body of work have its own particular integrity and not necessarily derive its value from its relationship to all other bodies or work. This has been a persistent concern since that time. Lux Aeterna 1999. Acrylic paint on canvas, 20 x 18 inches. Private collection.